Tender shreds of chicken, beans, corn, and spices, in a rich, flavorful broth. Load it up with cheddar cheese, sour cream and sliced green onions, and it’s a meal in itself. 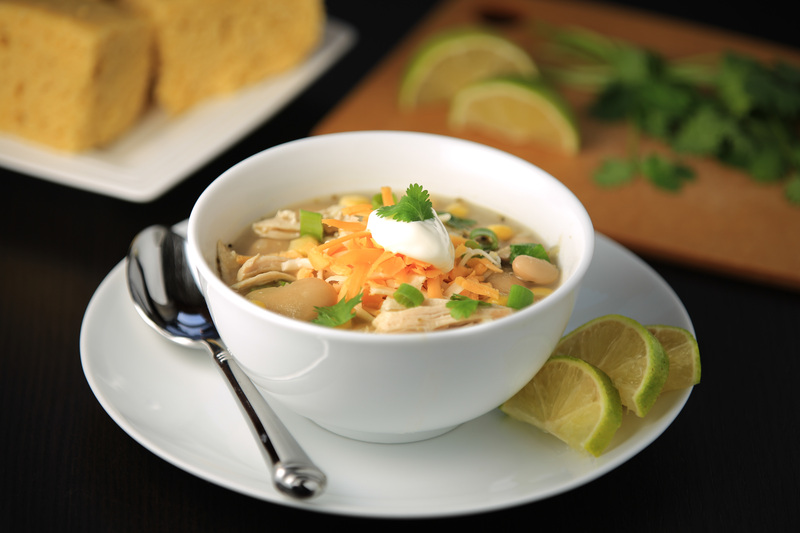 Healthy, hearty and easy to make, this White Chicken Chili will certainty be a hit for Super Bowl Sunday or any occasion. The big event for us this weekend was heading to the North American International Auto Show! Cars, lights, glitz and glam. The boys loved getting in all of the fun, new cars. What a great family outing! In the freezing cold month of January, there’s nothing better than a hearty meal to warm you up. My inspiration for this recipe came from a sweet friend of mine. A few years ago, after I had surgery, she brought us a wonderful chicken chili for dinner. Is there any better gift than a home cooked meal that you didn’t have to cook, just after surgery? Definitely not! It’s just pure love. I liked it so much, I knew it was something that I wanted to recreate for us one night. With ideas from my friend, and from Betty Crocker, I present to you, my take on this new family favorite, White Chicken Chili. 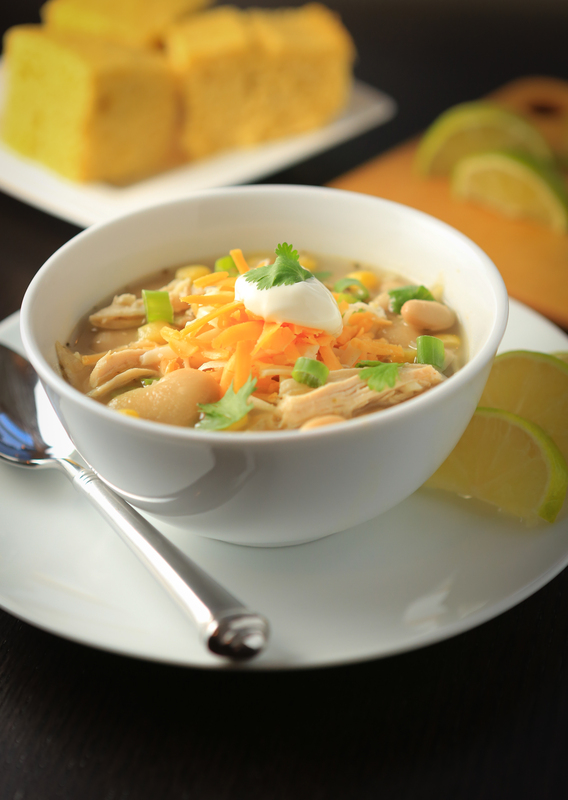 This White Chicken Chili is the perfect mix between soup and chili. A delicious, and soupy broth, combined with all the flavors of a rich chili taste. When you’re craving that “lighter” chili fair, this is certainly the recipe for you. It’s easy to make, incredibly satisfying, and oh so tasty! Guess what else? It’s even freezer friendly! I mean, let’s face it, there are just some days when you don’t feel like cooking. So while you’re making it, go ahead and double, or even triple your batch, and add it to your stash of freezer meals. That way, you’ll always have a great tasting, good for you meal, ready to go whenever you need one. Just pull it out of the freezer the night before, and pop it in the fridge. When dinner time rolls around, dump it in a pan and heat until hot. Grab the toppings, and sit down to enjoy your homemade feast, that you barely had to lift a finger for. We love to serve this topped with all the fixings! Sour cream, lots of cheddar cheese, and scallions. Sometimes we’ll even add fresh cilantro and a squeeze of lime. Covered, smothered, scattered, or plain, however you decide to serve this up, it is sure to be a winner. Whip up a batch of your favorite corn bread on the side, and you’ll have yourself the perfect Super Bowl meal! In a large dutch oven over medium heat, add oil and heat until shimmering. Add onions and salt, and cook for about 5-7 minutes until tender, stirring occasionally. Stir in garlic and cook until fragrant, about 30 seconds. Add the beans, corn, broth, cumin, oregano, and cayenne pepper. Stir together and over medium-high heat, bring to a boil, stirring occasionally. Reduce heat to low, and simmer uncovered for about 20 minutes. Stir in chicken, and simmer for 5 more minutes or until hot. Season with salt and pepper to taste, and serve with sour cream, cheddar cheese, sliced green onions, and a garnish of fresh chopped cilantro and a slice of lime if desired. To cook the chicken: pat chicken breasts dry with paper towels, then lightly season both sides with salt and pepper. Add one tablespoon oil to a grill pan or large skillet, and cook chicken over medium heat, turning occasionally, until cooked through. Move chicken to a clean plate, and when cool enough to handle, shred (pull apart) into thin pieces. 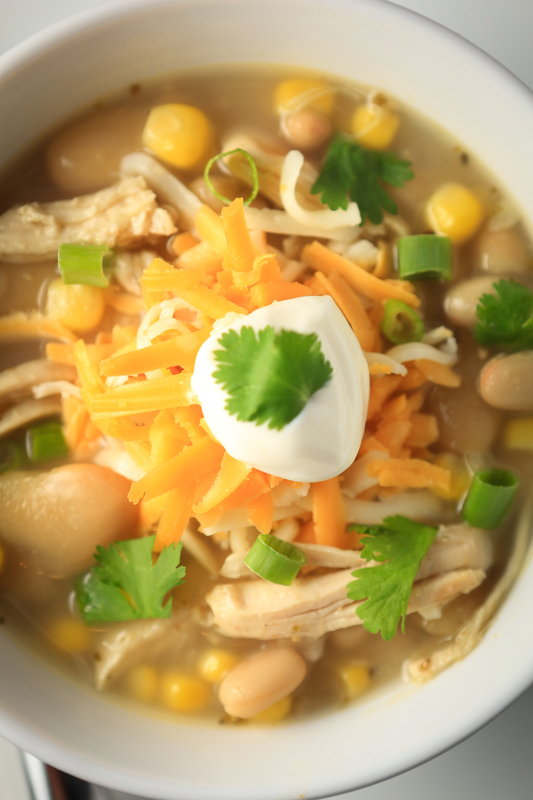 Feel free to stop by my old blog and check out the first version of this White Chicken Chili.